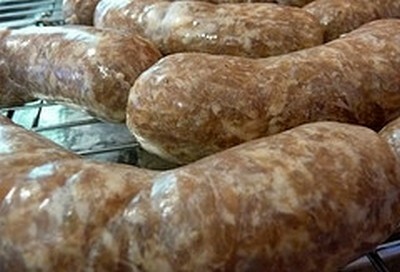 his is a killer homemade andouille sausage recipe. Explained in easy steps; you'll be making fantastic sausage in no time. Soak the sausage casing in cold water for about 1 hour to soften and loosen the salt. (Casings are packaged with LOTS of salt). After an hour, remove from water and cut into 3 pieces then place the narrow end of sausage stuffer into casing. Place wide end against faucet and run cold water through casing to remove any salt. Cut the pork and fat into chunks about 1/2" across and pass once through meat grinder. In a large bowl, combine the pork & fat with all other ingredients and mix well. (Use a wooden spoon or your clean hands). Cut the casings into 26" pieces and stuff. Fit the stuffer into meat grinder and follow instructions that came with the appliance. Stop filling about 1-1/4 inches from end and take the casing off. Smooth out any bumps with your fingers; be careful not to push the filling out in the process. Tie off the open end of the casing with a piece of string, or tie the casing itself. Repeat this process with remainder of mixture and casings. To cook the andouille sausage, fry in a hot skillet for about 12 minutes on each side until crisp at the edges.